On today’s episode, Landmark Home and Land Company president Steve Tuma discusses why renovating a new home is much harder than building a new home, and how can you can build the home you want. Interviewer: How are you doing everybody? Welcome to another episode of the Panelized Prefab Kit Home Building Show. With me today as always is the President and Founder of Landmark Home and Land Company, a company which has been helping people build their new homes where they want, exactly as they want across the nation and worldwide since 1993, Steve Tuma. How are you doing Steve? Steve Landmark: I’m doing great today. Steve Landmark: It has been a great day and we probably have a few interesting things to talk about. Interviewer: We always try. We always try to keep up with you because when it comes to this subject, you are the king. So one thing I would like to touch upon today is new technologies. In the last episode, we were talking about people going online and looking at these software programs where they can design their own home and all that. But everybody thinks that they can go online and understand the new technologies and knowledge of building a properly – building a home. So I would like to talk to you today about that, about these brand new techniques and learning curves and everything else to help our friends out there listening to build their home correctly. So why don’t we start with that? Give us a little feedback on that. Steve Landmark: Well, the interesting this is computers have been around for a little bit. But now the actual software, the designing elements, the CAD systems, the rendering systems, all these different things, give people the capability to understand their home a lot more. So just in the actual design, someone might say, “Hey, can you adjust the kitchen cabinet? Can you do something with the garage? Can you add a man cave? Can you put a workshop in the garage? Can you put an island in the kitchen? I need to be able to feed four people or entertain four people in the kitchen. So the actual designing processes are there. Not just for the 2-D CAD programs but also architectural renderings, kind of walk-through situations in the house or work around the house, looking at it in different perspectives. So the technology has vastly improved in just the last few years. It has been around for a while. But it’s harder to use and it wasn’t as good. Now it’s very, very complete. But there’s the technology of the design but then there’s also other technologies. You and I really don’t think about siding in a house with technology. You think of technology like electronics or a faster car or a more powerful truck or something. But do you think about the cement siding on my house as high-tech? Well, in a sense, a lot of this stuff is. They’ve got cement sidings, vinyl sidings, metal sidings, wood sidings, fake wood sidings. They’ve got all these different materials and the bottom line to it, with everyone’s busy lifestyle is it makes your quality of life better, maintenance-free, more options. So that’s a lot of the details, different flooring systems, different types of windows. Some windows that are better to put on the sunny side of the house, some windows that are better to put on the shady side of the house, some windows that are easier to clean. So there’s a lot more details into the house that make it a financially better move, but also for a quality of life and comfort of life. So the technology has really come along. I mean HVAC systems, the air conditioning and heating. There are different systems where you put a dollar in the gas line. You get 98 cents of heat out of it. Twenty years ago, it was 80 cents of heat you would get out of it. So here’s a variety of different situations and a lot of this is in places that people don’t think about because we’re so used to it. If you work in a modern office, there are electrical sockets all over. There’s the proper amperage. There’s the availability of it. A lot of people are putting in sockets in that have USB connectors, occupancy sensors in houses. You will notice that a lot in commercial places. You walk into a bathroom and it knows you’re there. Well, before it used to know that you’re there and then it also knows when you leave. In a lot of these cases, you have to turn it on and then it knows when you leave. The reason being is why turn it on if the room is already lit enough. Steve Landmark: So it wants you to go through the action. So all these technologies and codes can change and that I think you will find to be very interesting into the comfort of your home. You know, a lot of people don’t look at it in the benefits of the home. They will look at it as, “Oh my car, it’s key-less entry,” or the windows close automatically or it already – it knows the temperature or where I want the seat. You think about that with your car but you don’t necessarily look at your house as a piece of technology. When you look at smart homes, better energy efficiency, better designs, better materials to make it easier, to enjoy your home, there’s a lot going on there. That’s how we can help people. Interviewer: You were hitting on codes there for a moment and that’s one thing. We all feel that codes are kind of a necessary evil and sometimes a real pain in the behind. But explain to us how building codes are actually good for us, how they provide for a safer and more energy-efficient home. Steve Landmark: Well, it is interesting. A lot of people think that the codes are there to get you and some of them might seem a little ridiculous. But if you kind of go to the reason as to why they’re developed, there’s probably something really, really good. The simple one that probably a lot of people have in their home are things like the spindle spacing on decks or on staircases. Well, the idea is you still need light and ventilation. Some people get depressed without the right amount of light. But it’s also an emergency situation like an egress. So some – you could crawl out of a window say in the case of a fire. So a lot of these code situations are there for safety issues and when people can play with codes, I think you will see that in the long run, the quality and the value of the neighborhood is upheld. Interviewer: All right. That makes a lot of sense. Again, things that can be – what we would consider a pain in the behind or actually help us economically and functionality-wise, everything. So that’s good to know and here’s another thing I’ve been hearing a lot. Functional obsolescence. I have no idea exactly what that means. Can you go over that for us? Steve Landmark: It sounds like something that should be on a game show. Steve Landmark: Like you win a pizza or something for knowing. Interviewer: I will take functional obsolescence for a hundred, Alex. Steve Landmark: Exactly. So the idea that comes out of that is a properly-designed newer home. It’s going to be for today’s lifestyle. Like in a lot of older homes, there are formal dining rooms. You don’t see theater rooms. You don’t see game rooms. You don’t see family rooms all the time. It’s a formal dining. That’s the way people live. The dining rooms kind of go in the way of the dinosaur and even though I think it’s still a good thing to do. But a lot of people end up with gaming rooms. Their life is different. The technology has changed their life. How many cars are in a home? You go into the homes in the ‘50s, it was cool. They have a one-car garage. We’re building where people have 10-car garages. So there are different lifestyles. There are different things that come out of it. Some people entertain. They want big dining areas or they want kitchens with big islands or they want to take advantage of a view. So the basic idea behind the functional obsolescence is that as time passes, our lifestyles change. So sometimes these are actual floor plan issues. Sometimes it’s things like one electric socket in a bedroom. How does that happen in today’s world with all the electronic and gizmos that are in people’s houses? So it’s proper energy efficiency, so it’s comfortable, availability of energy. You know, the right amount of electric sockets, computer circuits, if you need hard-wired computer circuits. Then also just livability factors and safety factors like the egress window or a wall in the house for your 100-inch TV. I remember growing up with an 18-inch black and white TV or 19-inch. It was pretty cool. It’s like wow! Check that out! Steve Landmark: I was in a store and they have 100-plus-inch TVs. It’s like you need a wall to put that on. That’s going to change the design of your house if you’re someone that wants that type of a home theater. Steve Landmark: So it’s pretty interesting. We had one situation where the husband liked to watch the game. The wife liked to cook. So her girlfriends would come over. They would cook. Then the guys would get together, watch a game or racing or whatever they’re watching. We actually designed a wall that they could slide between the two rooms. So that when it’s time to socialize, they can do it. But then when it’s time for the game to come on or whatever, their voices or noises weren’t canceling each other out. Steve Landmark: So yeah. So in a situation like that, it helped their marriage. They were able to have fun, have their friends over but not get in each other’s hair. So sometimes design elements like that are very important. Oh, and bathrooms. Bathrooms now, they’re not just a toilet, a sink and a shower. I mean some of these have showers, sinks, hot tubs, private little toilet rooms, his and her, walk-in closets. Interviewer: TV and – yeah. It’s amazing. Steve Landmark: Even if you go into the big mansions of the turn of the century, they still had closets for like three shirts. It’s kind of weird. You have this big mansion and you have four shirts or something. It doesn’t make sense. So today’s life is different. That’s basically what we do to get rid of functional obsolescence is design the right panelized home and home package, so that you get a house that makes sense. Interviewer: Right. Do you adhere to the old adage that renovating a house is harder than building a new one? I mean that seems like a concept that not many people could get their heads around. Steve Landmark: Yeah. A lot of people get into renovating. They’re like, “Well, I could just do it over time or I could do this or my brother will help with this.” The problem with renovating is it’s probably an older home and overtime things happen. Foundations settle. People add on. They fix things. They do whatever it is to get through the situation. But it’s not always done right. So when you get into a situation and you’re tearing a wall apart, you’re not exactly sure what you’re getting into. That’s the problem with budgeting and your time commitment. Sometimes these – you know, renovating a house, you’ve got to adjust your budget and do it to deal with the unknowns. In some cases, you still end up with a functional obsolescence we just spoke about. So with a new home, you could plan it out and execute the construction of the home where with a renovation, there’s just a lot of unknowns. You could tear a wall apart and find out it’s all rotted from a leak that was going on for 10 or 15 years. Steve Landmark: But the previous owner just did a great job putting siding over it on the outside, but never fixed the actual results of the problem. The problem being the water leak. The result, a structural wall that isn’t solid anymore. So we’re seeing a lot of flippers are getting out of flipping and it’s a new home building because they can control it. Interviewer: Yeah, that seems like a lot of iffy propositions when you think about it. There’s a couple of things that I wanted to go over that Landmark sort of prides itself on and talks about on the website that you guys are pretty much known for. One is controlling the quality of your home. Why don’t you give us the lowdown on what Landmark means exactly when they say that you as the builder can control the quality of your home? Steve Landmark: Well, the basic idea of that is you go through and develop the design. So there’s the quality as far as the quality. You know, three bedrooms, two-bath, three-car garage, whatever it would be. But then there’s the quality of – you know, longevity of the home, the type of materials that you’re putting in. So some people, if they’re building a baseline home, something simple, they still want it to be built right. But you don’t necessarily have to have the $500 faucet. You can have the good, solid everyday $40 faucet. But depending on your attitude, you might want to dress it up a little more. You might want to keep it basic. Steve Landmark: We always tell people build the best quality that you can because in the long run, it will pay off. It’s better to pay a little now and get it done right than it is to pay a lot over time. That’s the point that I can come into. So people couldn’t put in the features that they want. Say if there’s a fireplace. They could fit the fireplace in that they want. If they want brick on the side or stone or a certain roof or ceiling height, they could put them in. Now, we’ve worked for people in all budget ranges, going from the tens of thousands for a house and the multimillions to build a house. Everyone has the same problem. It’s just how many zeros are behind their budget. So the difference can go through. So some things you can change. You can always change your carpet. It’s not as easy to add a basement. So sometimes when someone is there saying, “Hey, Steve. Should I put a basement in or get a nicer carpet?” I’m like, “Well, if you want a basement, I would put the basement in because you can change your carpet. So there are things that we can do and we always suggest that people have a set of plans with the proper information so that they can budget their house properly and know what’s going into it. You can say, “Hey, I’m having a basement. I’m putting tile on the bathrooms and the kitchens and I’m putting hardwood in the living areas and I’m putting this type of window here,” and you can add it up and come up with a budget and that I think you will find to be extremely important, so that you can grasp the project and understand what you’re doing, but also make sure that your wallet matches up with what you intend to build. Interviewer: Sure. One thing when I’m talking to you that always strikes me is right now we’re talking about new building technologies, et cetera. But I think one thing that Landmark does really well is you guys take that new technology and that knowledge and you still add it to that old sort of Ben Franklin common sense kind of thing and you combine those things. I think that’s what people really appreciate about your company. Steve Landmark: Well, what we’re trying to do is make it understandable because there are a lot of cool things that can go into your house. But do they make sense? Steve Landmark: Just because you can get a car that goes 250 miles an hour, does that mean that you should have it, that you should do it? Steve Landmark: By the way, do the people with 250-mile-an-hour cars really drive them 250 miles an hour? Steve Landmark: So it’s kind of one of these things that we’ve gotten feedback from customers, seeing what makes sense. We’ve got a very strong basis. Now, we’re not going to go through and tell a customer and say, “Hey, Mr. and Mrs. Customer, you must do this.” We’re going to present the options to them through conversation and then they could prioritize what’s there. If they want to build a 1000-square-foot house and a 5000-square-foot garage, that’s great. If they want to put an airplane hangar on it, that’s great too. If they want a pool inside, that’s great too. If they want to say, “Hey, I want to build a 4000-square-foot house, my whole family is going to move in there and we’re not going to have a garage,” if that’s what they want, we can work with them. So that’s the idea is to be a support system and a resource to give people the information so that they can make a decision on what’s best for them and their house. Everyone lives differently. Steve, over the course of time, people will live differently in different parts of their life. When they’re a student, when they’re newly married, when their kids have left, when they’re retiring, when they’re remarried, whatever the situation is. People live in different ways and those needs are different. People’s hobbies change. People live different ways. Some people care about their garage. Some people don’t care. Steve Landmark: They always get a carry-out. Yeah. So there are different priorities and I think that’s the important part of it is build a house that makes sense for you. Steve Landmark: Now you still want to look about resale if you want to do it. So you don’t want to do things that are really crazy. But there are things where I think if you’re going to spend the time building your house, one of the main reasons is not just the pride that you did it but it’s also you know what you’re getting and you understand it and it works out well for you. That I think is the key issue. You know, building a house is cool. But pulling up to it every day after a hard day’s work and going, “I’m proud of this,” that’s what it’s about. Steve Landmark: That’s how we can help. Interviewer: Let’s go to another thing that Landmark – on the website you talk about. Building the floor plan that you want. It seems pretty basic but run it down for us. What exactly does Landmark mean when you guys say that we will help you build the floor plan that you want? Steve Landmark: Well, that gets into the design element. It’s not just floor plan. It’s the overall design. But fundamentally, the floor plan, because people will live different ways. We’re currently working with a family that’s going to be a blending of the parents. There are three generations – the grandparents, the parents and the kids. So there are reasons why it helps and makes sense for them to live together. Steve Landmark: The parents, I call the middle generation, have to go to work and the grandparents enjoy the kids. So they go to work. There’s kind of a built-in babysitter. It’s good for the grandparents to have active people, have the family around. So we were able to work with them and take their ideas and get them on paper, so that there’s a floor plan that makes sense. So in the center, there’s the common living areas, two living rooms. You know, so the families can be there. But then there’s also the joint places where they could work together and spend time together. But hey, if they need a little privacy, they have their own little TV areas and reading areas and then two separate master suites. So for that family, it makes sense. Now that floor plan for a single guy may not make sense. So the single guy or some of the things – say they might be married in a few years. They might look at it a different way. An empty nester may design a complete different home. Steve, the world is changing. So some of these changes, it’s kind of interesting of how people in their 20s and 30s seem to want a floor plan that may be somewhat of an empty nester. Say someone retiring in their 60s or 70s. They may want two or three bedrooms and a home office “convertible” room. Home office but if a friend comes over, there’s an extra bedroom. Steve Landmark: The younger people might want a gaming room or an entertainment room. Well, that room could also be called a library for someone else that’s retiring or they have a hobby room. So in some of these cases, the different lifestyles blend and that’s what we talk about by the floor plan that you want. Let’s get you the house that makes sense because a lot of people may not realize it. But the environment that you live in makes your life easier. If you enjoy it, if you enjoy reading or watching TV or cooking or working on your car, if you have that right space, it enhances your life. So that’s what it’s about, making sure that it’s right. Steve, the simply analogy, you don’t just go in a store and say, “Give me a shoe.” You say, “Hey, I’m into hiking. I need this type of shoe. I want this material, this type of tread.” You buy that shoes. That allows you to enjoy hiking. If you went into a shoe store and they gave you a high heel and you went hiking, you’re probably not going to enjoy your hike. So the same thing happens with the proper design of a home and it’s the floor plan as we discussed but it’s also put a window where the view is. Have the exterior look that you like. Do you like sitting outside? Do you live in a climate where you’re going to need a porch? Do you want a porch on the front, the back, both, all around? Whatever it may be. So it’s the design elements where we will spend that extra time to make sure that the house is the way you want it to be. Interviewer: So why don’t you run down for us how we find you guys over at Landmark Home and Land Company? Steve Landmark: Well, the quickest way that someone can look at 24 hours a day is right on the internet. They’re at our website. It’s www.LHLC.com, kind of the initials of Landmark Home and Land Company, but it’s www.LHLC.com and you can also send us an email. You can email Mike. You can help customers in the preliminary stages. It’s mike@lhlc.com or if you would like to email me directly, it’s landmark@lhlc.com and then there’s also the telephone. So we will communicate with people at their convenience in a method that makes sense at 800-830-9788. Yes, we talk to people. If for some reason, we can’t take the call right when you call, you can leave a message and we will get back with you right away and take care of you and spend the time to make sure that you’re properly taken care of. It’s the service that matters. Interviewer: Well, fantastic. 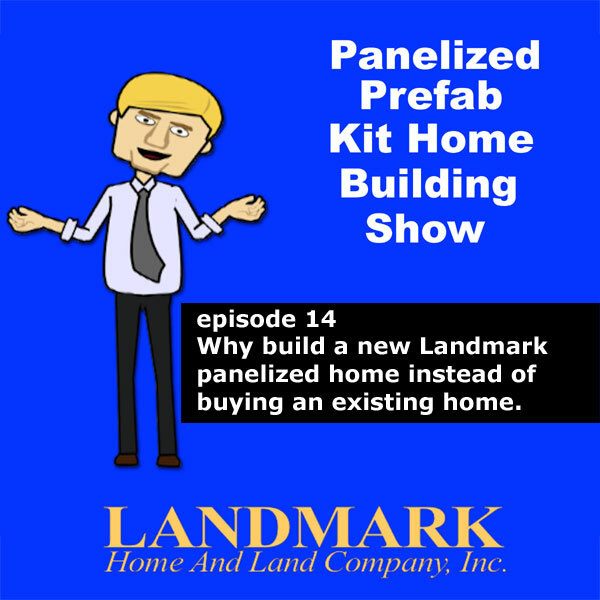 This has been a really great episode of the Panelized Prefab Kit Home Building Show and well, for President and Founder of Landmark, Steve Tuma and myself, I want to thank you for joining us and Steve, thanks for a very informative episode. I really appreciate it. Steve Landmark: Well, I think we got more to come. Steve Landmark: People should check back and listen to the – what do we have? We have a few podcasts out there people can listen on, listen to the different topics and gather some knowledge. Interviewer: And we’re creating more all the time. So keep an ear out for more of the Panelized Prefab Kit Home Building Show. Until next time, see you later everyone.